Weak window motors are a common ailment in the earlier Stevens Esprits (prior to the S4). The window would stop moving halfway through its travel. In order to remedy this problem, you may have to remove the window motors, or adjust the window tracks. In order to get access to these, you must first remove the leather door trim panel. On a Difficulty Scale of 1 to 10, this procedure rates a 2. Here's how to remove the inside door panel from an '89-'93 Esprit, and some methods for repairing mechanical problems which can cause difficulty in the operation of the power windows. Click on any photo to see a larger image. Click the Back button on your browser to return to this page. Remove the two small trim screws, each securing one side of the door panel. These are located near the very bottom of the door on the side edges of the panel. There are three screws inside the door pull (red arrows). 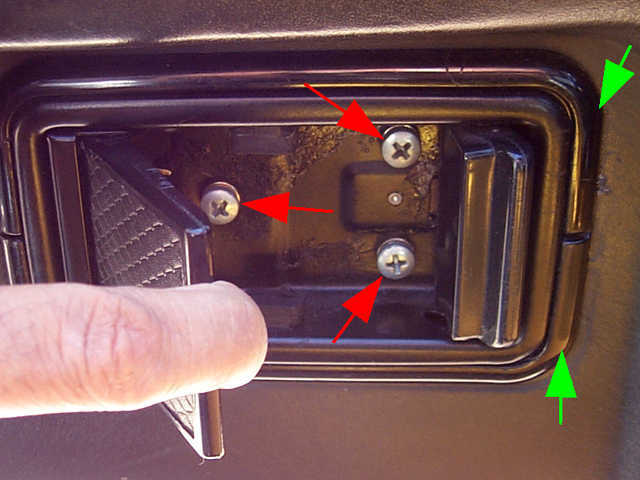 Loosen, but do not remove these screws, until the two plastic pieces (green arrows) which form the surrounds can be slipped off. One of the screws is somewhat hidden behind the pull handle. If you should accidentally remove one of the screws, reinstall it a short ways before loosening another. The door panel can now be removed by pulling outwards several inches at the bottom and then lifting up about an inch to clear the top of the door. Use care not to pull the panel too far from the door as you may damage the wiring harnesses. If you wish to remove the panel completely, disconnect the three wiring connectors. 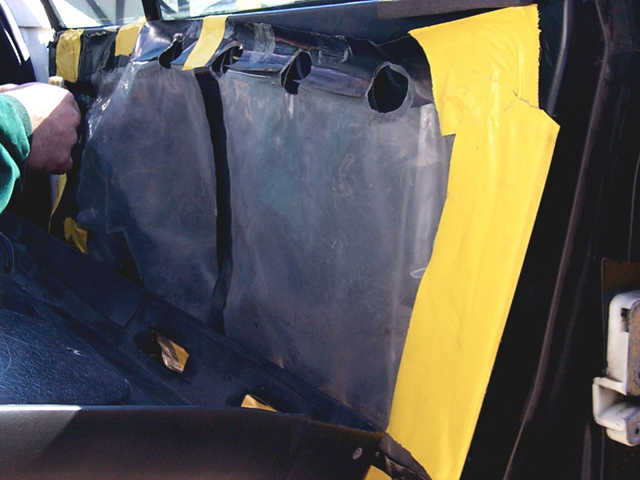 Make note of the position of the plastic vapour shields for reassembly purposes, and either move or remove them as necessary to gain access to the window mechanism. 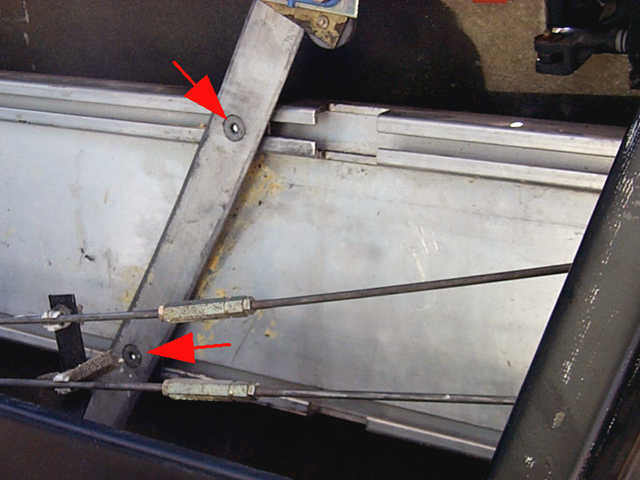 Check the two screws which hold the guide rail to the door beam. If they are loose, tighten them with a 4mm Allen-head wrench. Apply some lubricant to the track. With the wiring harness reattached and the ignition on , test the operation of the window. If it is not smooth both up and down, loosen the screws enough so that the rail can be moved horizontally and run the window down and up again. The rail should move to its most natural postion. Tighten the screws again and test. When you are satisfied with the operation, remove the two screws one at a time, apply a removable threadlocker (e.g. Loctite), reinsert, and tighten fully. The nuts holding the window regulator assembly to the door beam may come loose as well, check and if necessary tighten them.